Many people who visit Tulum never make it out of the beach zone. Finding themselves in the bliss of the wide white sandy beaches and blue Caribbean Sea, content to not travel beyond the jungle boutiques, restaurants and eco chic hotels. There is absolutely nothing wrong with that either, we get it! However, most of this list is probably not for you. For the rest of you explorers, Tulum is full of adventures and amazing experiences just waiting to happen…beyond the beaches! We love the beaches too, it’s one of the best things to do in Tulum, but there is so much more to see and explore in the area. To get the most from your Tulum time we highly recommend renting a car - for at least part of your stay. Being mobile in Tulum can make a big difference in your overall experience, there is a lot to see and do beyond walking and biking range! You CAN also do many of these fun things through tour companies and/or by taxi or bike from the beach or downtown Tulum. If you are already staying in town or near downtown Tulum, you already know, the Centro is a great spot to go for a night out on the town. It’s also a great place for lunch and shopping! About 1 mile or 1.5 KM from one end to the other, main street and the once quiet fishing village is a growing tourist attraction for people that came for the beach. Downtown Tulum also offers fantastic happy hours, night life with drink specials, live music, delectable food options and people watching. Settle in for the view from one of the numerous sidewalk cafes, bars and restaurants – it’s a great place to start your evening. 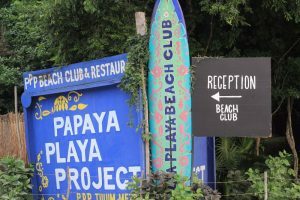 The atmosphere is decidedly different and more casual compared with the more upscale captive atmosphere of the beach hotel zone. More authentic Mexican - Mayan feel, this is still a small beach town in Mexico and where the locals live and frequent. Around sunset you will find families gathering at the central square (centro) and tourists starting to fill the sidewalks. It’s also a fun place to shop where you can still bargain with many of the shop keepers. Many bars and restaurants feature live music - you can find it somewhere in town every night of the week. 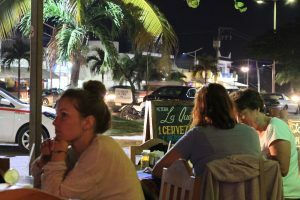 Get off the main ave. a couple blocks and you’ll find more and more restaurants and bars popping up, there’s always something going on around downtown Tulum! The Coba ruins are about a 45-minute drive from Tulum, headed west into the jungle. One of the largest Mayan cities on the entire Yucatan Peninsula, it’s an impressive ruins site and large enough to ride on bikes through the jungle. Readily available and for rent ($50 pesos in 2018) near the entrance to the park, we also recommend getting a guide to ride with you! After the ruins, you can cool off at the nearby cenotes, just a few more miles up the road. There are 3 in all, Tamcach-Ha, Choo-Ha and Multum-Ha, and they are all subterranean, deep and impressive. 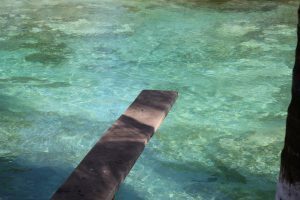 One of the cenotes has a couple diving platforms to leap from, if you are brave enough. One of them is over 30 feet! There are several local bars on the beach and some private venues in the jungle where you can experience the spectacle of a late night, dare we say all night and into the next day party event! At least a couple times a week you can find these parties featuring live music, DJ’s and often circus performers of one sort or another. Even if you are not into this type of party, it’s a fun thing to do once, and it is truly a spectacle to behold. Go early and stay late or do something in between. When friends come to town and want to go party, I am personally out of there by midnight, most cool people are showing up then! Parties are more frequent around full moons and high seasons. If day time beach parties are more your pace, Sundays are the big day for the best beach parties and BBQs. The stretch of beaches south of the Tulum ruins to the Sian Kaan are the main beaches of Tulum, but there are a few nearby locations that are worth the trip to check out. If you like to snorkel and you have a day when water is calmer, the most amazing snorkeling we have found ANYWHERE around Tulum – off the beach, is Xcacel Xcacelito. A very lively section reef is closer to shore here and provides amazing drift snorkeling from the north end. It is also a sea turtle conservation site where you will find nesting sea turtles and marked nests in season. They also have hatch release programs for the local schools. 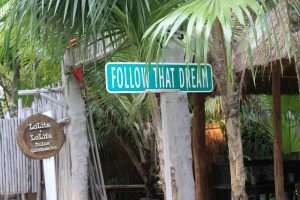 To get there, travel N on Hwy 307 (Main Street Tulum). Stay on Hwy 307 for about 10 minutes as you are headed out of town. About 1.5 miles / 2 KM past Xel - Ha Aquatic Park on the highway, Xcacelito is on the right-hand side of the hwy, and is marked by a medium size blue and white banner sign that has a sea turtle on it and the Maya names “Xcacel Xcacelito.” Accessing the reef from the north end of the beach easiest for snorkeling. If you get here on a windy or high seas day, you can also body surf in the middle section of the half moon bay. There is also a cenote (spring) you can explore and snorkel in. It’s a nice jungle walk that opens into a crystal-clear spring surrounded by mangroves. You will want to pack your own cooler of snacks and drinks and bring your sun umbrella if you plan to hang out. They usually have people on the beach offering to rent you an umbrella but bring one just in case no one is there to rent you one. To get to Punta Laguna, head towards Coba and make a right, instead of left at the big roundabout. Once you make the right, it’s another 12 miles / 20K to get to the entrance to the reserve. Go early in the morning or early in the evening for the best time to see wild Spider and Howler monkeys. Entry to the reserve is $100 pesos per person, but that can change anytime. We highly recommend getting a guide when you arrive, guides will range from $300-$500 pesos. They will take you through the old growth jungle forest and lead you to the monkeys. There is also a beautiful lagoon in the reserve that you can paddle a canoe around. They also have a couple zip lines that go over the lagoon and surrounding jungle. This is a fabulous place to see monkeys in their natural habitat. Bring your camera! A UNESCO World Heritage site, if you like nature, this is a spectacular place to see. BY CAR: Head south on the beach road and go through the stone arch where the road turns to dirt. As you drive along the narrow two-lane road you will have the ocean to one side and the lagoon to the other. If you are adventurous, take the beach road south and keep going all the way to Punta Allen – about 30 miles or 50 KM, a small fishing village at the very end of the peninsula. Road conditions may be a factor, but we recommend at least making it to the Boca Paila bridge, which is about 1/3 of the way to Punta Allen. At the bridge you have a great view of where the sea meets the lagoon and you can often sea large crocodiles right there! If you want to see more on the water, you will need to book a tour of the Sian Kaan with a local guide. That can be a once in a lifetime experience! 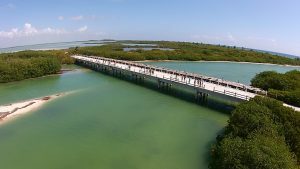 If you are into fly fishing, the reserve is also known for world class fishing where you can find lots of Bone fish, Permit, Snook and Tarpon-it’s one of the few places in the world where you can get the grand slam of fishing in one location. CENOTE #1: Start your day south of Tulum at one of the largest easily accessible lagoons around Tulum, Kaan Luum. 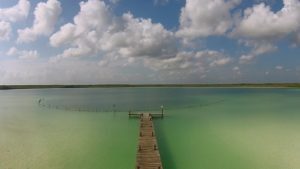 As with any body of water on the Yucatan, Kaan Luum is technically a large and deep cenote, but it appears to be more like a large lake or lagoon. Take hwy 307 south to KM marker 217, it’s about 10 minutes south of Tulum on the hwy – look for the sign. Don’t forget to exfoliate with the Mayan clay mud. CENOTE #2 and #3: On the way back from Kaan Luum you can make one stop and see 2 cenotes! Just about 1 mile / 2km south of downtown Tulum, you will find Crystal and Escondido cenotes. One on each side of the hwy and each offering something cool. With a diving platform and room to swim, these are a couple easy ones to get close to Tulum. CENOTE #4: Casa Cenote is one of our personal favorite above ground cenotes, it is well worth the drive 10 minutes north of town. Look for the signs off the hwy for Casa Cenote and Blue Sky pizza and take the straight dirt road towards the beach. When you get to the “T”, go left and continue 200 meters, you will see the cenote on your left. There are a couple places where you can always find good snorkeling due to the proximity of the reef to the shore. In these spots the waters are always calm and protected. Chamicos beach is one of those places - they also have a low-key beach bar and seafood restaurant on site. Take highway 307 north out of the town of Tulum towards Akumal. Look for the Oscar and Lalo’s restaurant at the turn off, (they are on the other side of the highway from the turn) and a sign for a hotel there called “Jashita”.